In this little book, we discover that if Christianity isn't about forgiveness, it's about nothing at all. But is there a limit to forgiveness? Is it always possible? Or even always right? This book begins with Simon Wiesenthal, an Austrian Jew imprisoned in a Nazi concentration camp during WWII, who was confronted with the plea for forgiveness from a dying Nazi SS soldier. This book will challenge you with the question: "What would you do?" The Question of Forgiveness reminds us that Christ's command to love your enemy is very hard to do, but as followers of Christ, we are called to believe that love is more powerful than hate-something that Christ modeled to the extreme of Calvary's cross. Zahnd digs into the question of forgiveness, and concludes with this: beyond the suffering of unconditional forgiveness lie the resurrection of love and the triumph of peace. 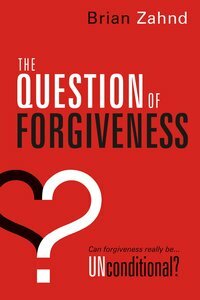 About "The Question of Forgiveness"
Brian Zahnd and his wife, Peri, founded Word of Life Church in St. Joseph, Missouri. The church has experienced remarkable growth, and now has over 4,000 active members. He also travels throughout the nation and overseas ministering in churches, international crusades, and pastors' seminars. He and Peri have three sons.